As the winter months approach, things are getting wetter and wetter outside. While this doesn’t pose an immediate risk to your personal health, it can lead to issues within your home. 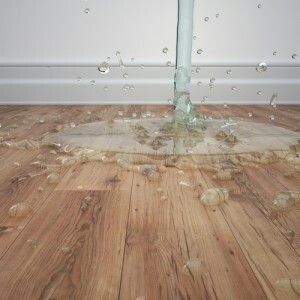 Excess water can lead to flooding of low-lying areas, which can compromise the integrity of your hardwood flooring. There are many factors that cause flooding, including improper disposal of certain materials like fats, oils, grease, and diapers, tree roots growing through cracks in water lines and causing them to become blocked, and frozen water pipes. Sewer backups caused by overloaded storm water and sanitary sewage infrastructure, vandals blocking lines with bricks, wood, oil filters, and other materials, as well as illegal hookups allowing excess water in to the lines can also lead to flooding damage in your home. Taking a little stroll around your house can reveal several small projects that will help you reduce the likelihood of flooding occurring in your home during the wet winter months. Make sure that all floor drains in and around your home are kept clear of obstruction and be sure that the areas immediately around your home are graded properly. If you’re going to be away from your home for a few days, make sure to arrange for a trusted friend or neighbor to check in on your property at least once every day to catch any potential flooding that could occur while you’re gone. Getting a little more serious, you can also install a sump pump and backflow valves or plugs for drains, toilets, and other sewer connections to help stop water before it enters your home. Take some time to be sure that all important documents stored near the floor are housed in watertight containers, or move them up to an area where they won’t be quite as susceptible to water damage. The first important rule when you find water in your home is to approach the scene with caution. Be careful not to turn on any electrical switches until you’ve conducted a thorough check of the electrical system. Shut power off using your main switch, but be sure to stand on a dry surface and use a non-conductive material, such as rubber or plastic, to actually flip the switch. Make sure to smell for any gas fumes, and if you smell any weird odors, be sure to call your gas company immediately. Once you’ve found the source of flooding, you can take steps to protect other areas of your home from becoming damaged. Boarding up holes or shutting off your water supply can help to ensure that water doesn’t start to seep into other areas of your home. Once you’ve got a decent handle on things, be sure to give your insurance representative a call to inform him or her of what has happened. This will help you get the ball rolling with an assessment of the damage and you’ll receive compensation and be able to begin repairing any damaged areas as soon as possible. Flood damage can be a huge burden for many families, but with a little proper planning, and the knowledge of how to handle the situation if flooding does occur, you’ll be able to minimize the amount of water damage in your home this winter.